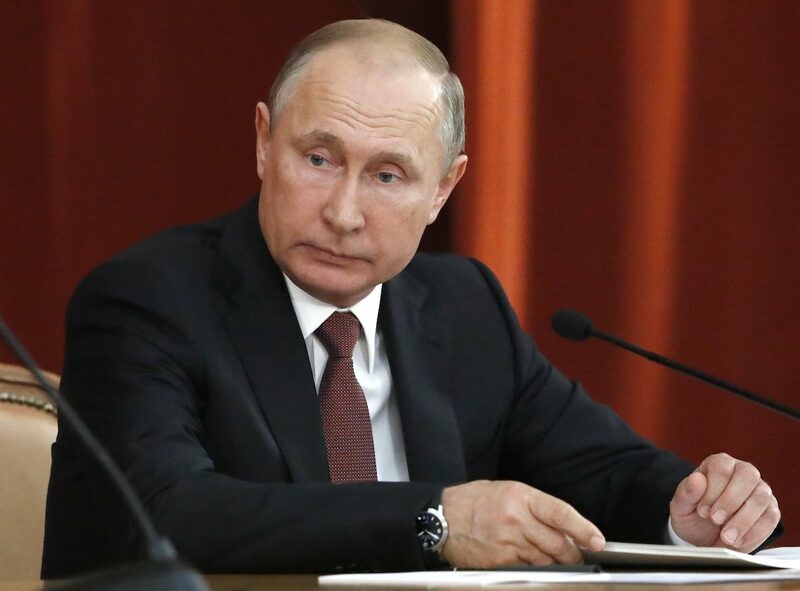 By Manuela Tobias on Thursday, July 19th, 2018 at 5:01 p.m.
Russian Vladimir Putin attends a meeting with Russian ambassadors to foreign countries in Moscow on July 19, 2018. Fox News host Chris Wallace pressed Russian President Vladimir Putin on the subjects President Donald Trump failed to bring up in an interview following the press conference. Among those topics were the deaths, disappearances and attacks on multiple Putin critics under mysterious circumstances. Wallace said that when Putin was elected in 2000, he was portrayed as a democratic reformer, so he asked what had happened since. "You say nothing happened to you, but I need to ask you, domestically, not internationally, domestically, inside Russia, why is it that so many of the people that opposed Vladimir Putin end up dead or close to it?" Putin dodged the question, saying that everyone, including Trump, has political rivals, and pointed to the assassination of Martin Luther King Jr., John F. Kennedy, and police violence in the United States. We wanted to know: Do people who oppose Putin end up dead, or close to it? Before launching into the novelesque crimes tied to the Russian state, we have to clarify that pinning anything specific on Putin is difficult. Harley Balzer, a professor of government affairs at Georgetown University who specializes in Russian and East European studies, attributed that to the KGB’s signature, or lack thereof: They leave no fingerprints. "Many of us assume that some of the killings would have required Putin's (at least tacit) approval," Balzer said. "But no one has solid evidence." Wallace named three victims of crimes that have been linked to the Kremlin, so we wanted to dig into the details. Below are the most prominent cases that Wallace mentioned, as well as journalists who have died. Wallace mentioned Sergei Skripal, a former Russian spy who doubled as a spy for the British government. Skripal and his daughter were the victims of a nerve agent attack in England in March. The British government blames Russia for the attack, which Russia denies. Wallace also mentioned Boris Nemtsov, a political star with presidential aspirations in the 1990s. Nemtsov supported Putin’s victory in 2000, but became an anti-Putin activist as his fellow young reformer increasingly curbed civil liberties. He was shot in 2015 the day before a march he organized to protest Russia’s economy and military involvement in Ukraine. Alexander Litvinenko was a former Russian secret service agent. In November 1998, Litvinenko and other FSB officers accused their superiors of assassinating a Russian tycoon. Litvinenko was arrested and eventually had charges dismissed in 2000. Litvinenko was granted asylum in London, where he wrote two books accusing Putin of staging a terrorist attack linked to his rise to power and ordering journalist Anna Politkovskaya’s murder. He subsequently fell ill and died of radioactive polonium poisoning. In January 2016, we tallied journalists whose deaths were classified as homicides by authorities or watchdog groups since Putin assumed office in 2000. The updated count is 38. Here are some of the most famous cases. Politkovskaya, who covered human rights abuses by the Russian military in Chechnya, was shot outside her apartment. While five men were convicted of her murder, the judge found it was a contract killing by an unknown person. The European Court of Human Rights determined the court "failed to take adequate investigatory steps to find the person or persons who had commissioned the murder." Natalia Estemirova, who sometimes worked with Politkovskaya, covered abductions and murders in Chechnya until she became a victim herself. She was kidnapped on her way to work, shot and found in the woods near her home. Anastasiya Baburova, another journalist, was shot and killed within walking distance of the Kremlin alongside Stanislav Markelov, a human rights lawyer representing Politkovskaya and other journalists critical of Putin. Yuri Shchekochikhin, an investigative journalist and liberal lawmaker, investigated the Three Whales affair, a corruption scandal that implicated officers across Russia’s secret service. Days before his scheduled meeting with FBI investigators in 2003, Shchekochikhin died in his apartment from an unknown allergen. His medical documents were classified by Russian authorities.